This way-marked trail almost starts on the runway of Dublin airport. 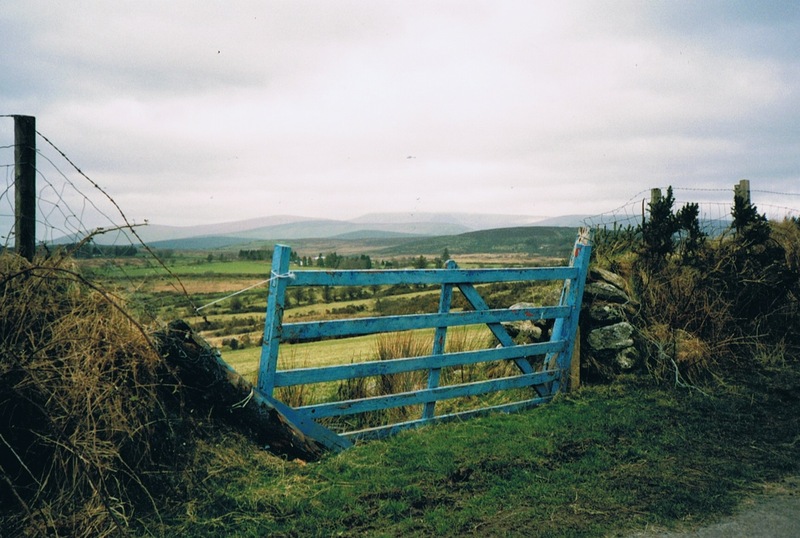 We started more south, in Tinahaly, and walked back direction Dublin. Further south the amount of asphalt would increase a lot, we understand. The whole trail is 132 km. Getting there: a flight to Dublin. From Dublin airport the bus to the railway station in the city center, the train to Rathdrum and finally the bus to Tinahaly. Maps: The Ordnance Survey of Ireland, nr. 56 and 62, scale 1: 50.000. The route is well marked. It begins - or ends - in Clonagal, county Carlow. Accommodation: B&B's and guesthouses, There are plenty of them. The owner will arrange your next B&B, if necessary. Free camping is allowed. 2019: there should be a new B&B in Aghavannagh nowadays: Ballyteigue Lodge. 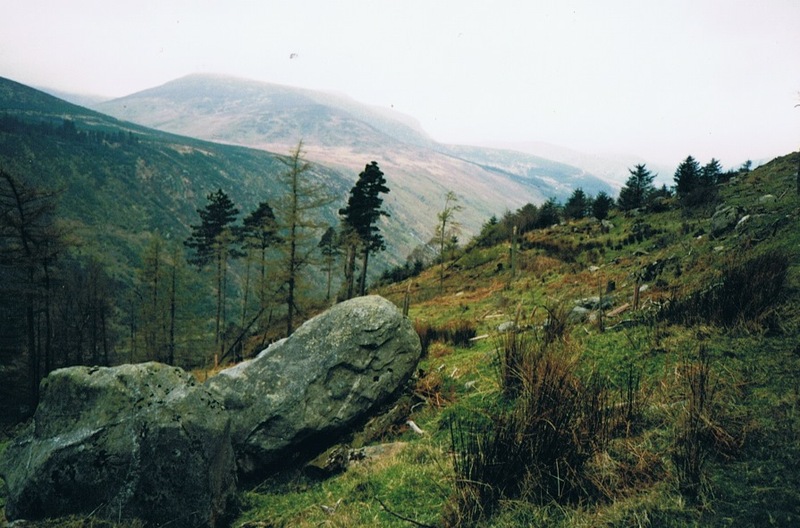 March 1998: a part of the Wicklow way. Height on the trail: 100 - 725 m.
Distance between the stage cities: 20 - 25 km. In Enniskerry the bus to Dublin railway station and from there the bus to the airport. 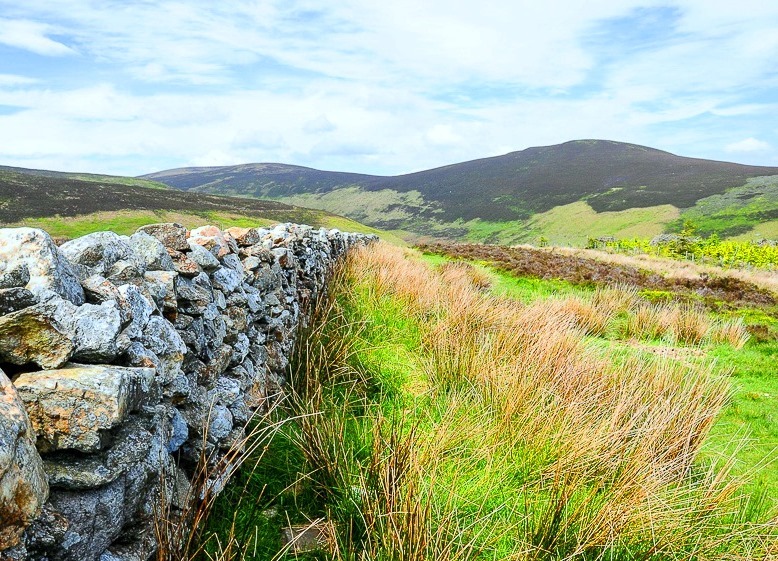 On trail:through “a patchwork of many different landscape types": Irish green, the Ow river, the Glannmalure valley, the round tower - a bell tower - of Laragh, the beautiful Lough Tay, Lough Dan, and the splendid cross at Djouce Mountain.” And also: some truly remote upland areas. 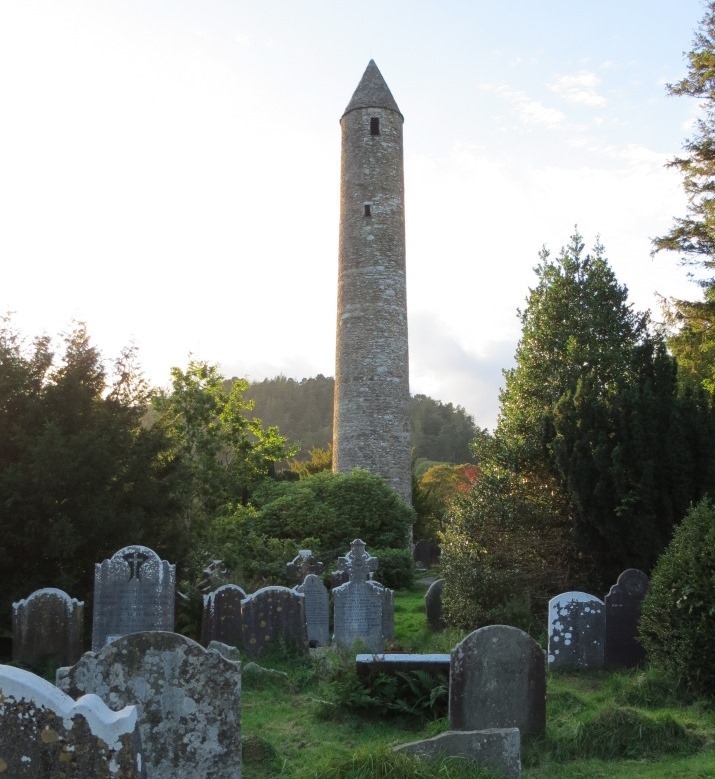 Day 2: in te 6th sentury St Kevin founded in Glendalough a monastic center, the remains are till there (church, round tower).Between mighty old trees. 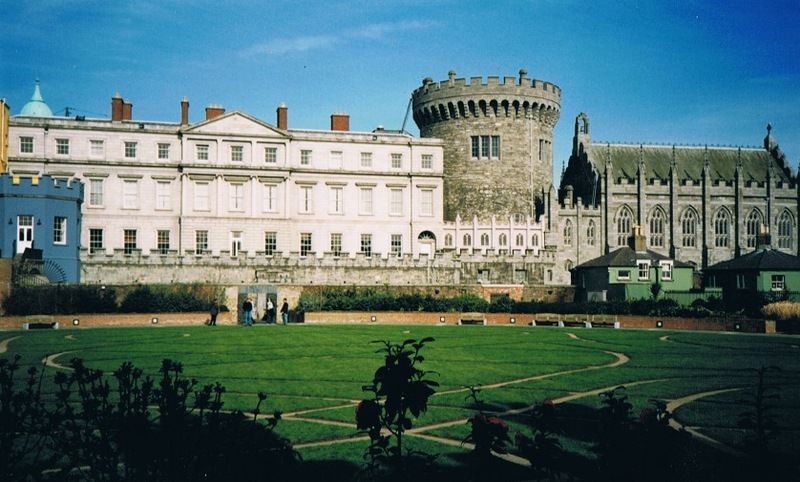 Nowadays a well known pilgrimage site.The book of Kells (in the museum of the university of Dublin:Trinity College.The Book of Kells is Ireland's greatest cultural treasure and the world's most famous medieval manuscript. 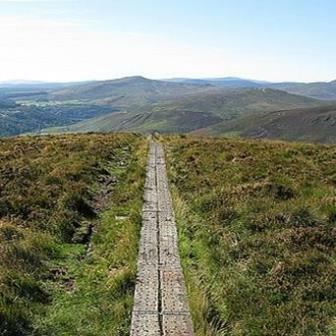 A beautiful board walk across Djouce Mountain (725 m) at the end of the trail. 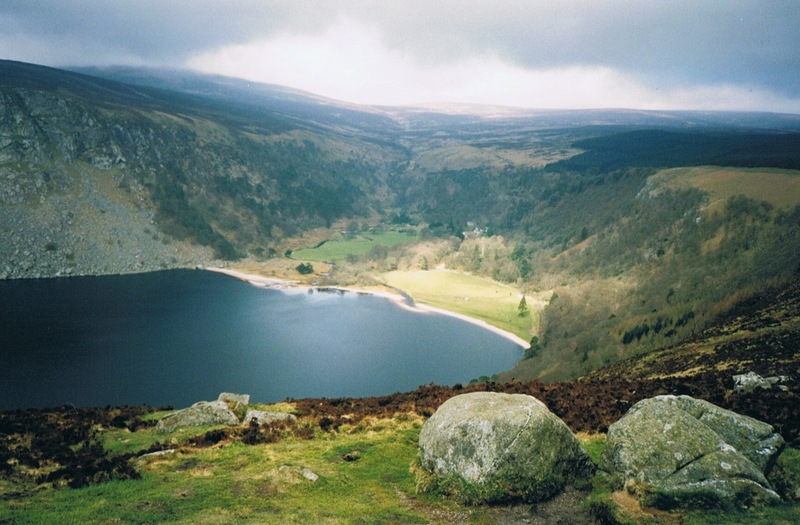 Also pay attention to the map on this day to avoid missing the Powerscourt Waterfall. A 121 m high waterfall, the highest in the country. So we missed him. We think it will cost you an entrance ticket (?). 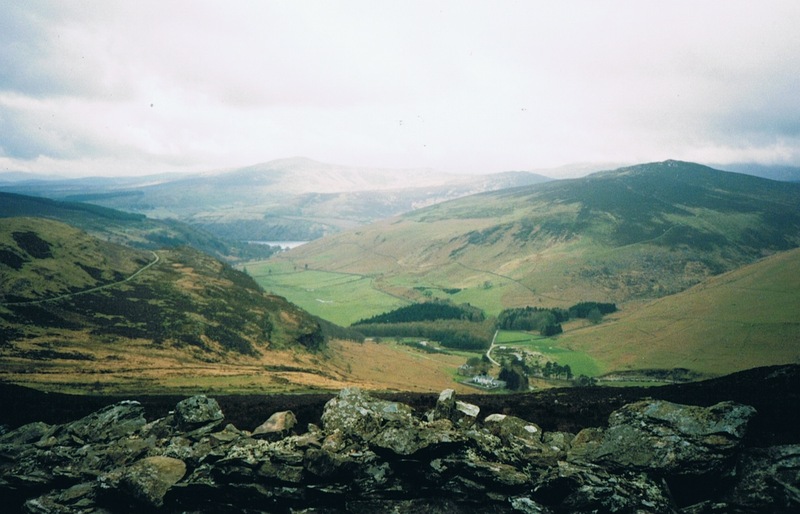 The terrain can be demanding in sections but achievable for walkers with average fitness. 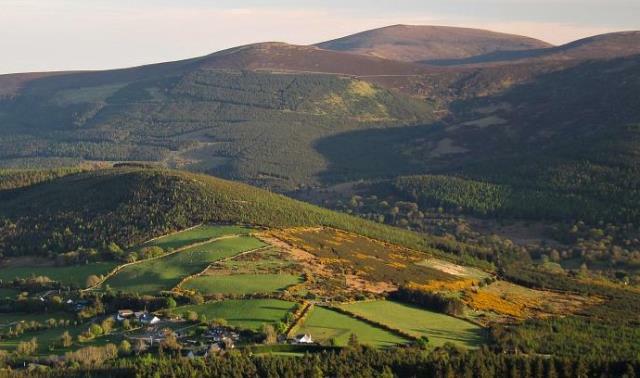 Below a video about Glendalough, in paticular the settlement - monastic center - of St.Kevin and the famous round tower.